1. TERMS : In the below listed regulations the words noted refer to specific terms: RACE, for the Olympus Marathon / ATHLETES, PARTICIPANTS, for the participants of the Olympus Marathon / COMMITTEE, for the Organising Committee of Olympus Marathon. 2. COMPLIANCE : All athletes are obliged to conform to the regulations listed below. Moreover, they are obliged to comply with the jury hints. Non-compliance with the regulations or hints attracts relative penalties. 3. PARTICIPATION : Men and women over the age of 18 are eligible to participate in the race provided that they have finished in the last two years (1/1/2017 until the end of registrations) in 2 mountain running races of 20 km with 1.000m positive altitude or above, or 1 mountain running races of 35 km with 2.200m positive altitude or above. The list of participants closes on May 15th (nearly a month prior to the race) or as soon as the number of participants reaches the specific number the Committee determines each year. The entry fee includes pasta party, refreshments and food during the race, the race T-shirt and medal (for the finishers). 4. CATEGORIES : Categories W18 & M18 include athletes at age between 18 and 23 years. Categories M (24-39), M40 (40-49), M50 (50-59), M60 (60-69), M70 (70-79). Categories W (24-39), W40 (40-49), W50 (50-59), W60 (60-69), W70 (70-79). 5. EVENT DATE: OM is held annually, every last Weekend of June. The start of the race is given at 6:05 a.m. at the archaeological site of Dion and the race closes exactly 10 (which is the time limit) hours after the start is given, in Litohoron Park. 6. RACE ROUTE: 38 out of the 44Km of the race are situated on trails and 6 on asphalt roads. The trails are neatly curved and marked. Additional marking will be done one day before the race, so that the route is as clear and distinct as possible. 7. TIME LIMIT: There are 4 cut off points in the race. Cutoff points are determined as follows: 1) in 2:20 hours at CP-3 (Koromilia), 2) in 3:40 hours at CP-5 (Petrostrounga), 3) in 7:30 hours at CP-9 (Prionia)and 4) in 8:45 hours at CP-11 (Kastana). The cut off points are set for the safety of the athletes themselves as well as for the smooth function of the race. The athletes unable to check at this points in the time required are not officially considered to be continuing the race and take the responsibility further on. 8. FINISH LINE: For a race to be considered valid, an athlete must have crossed the finish line within 10:00 hours. Any athlete finishing later than this limit will not be officially considered to have finished the race. 9. BIB NUMBER : Every athlete should be wearing a plastic material bib number, put on a clearly seen spot at the front of his outfit. Falsification of the bib or loss is penalized with disqualification. 10 . ROUTE MARKING : The marking of the route will be dense with colored bands, paint of bright colors and small signposts that will bear the logo of the race. 11. OUTSIDE ASSISTANCE : Any kind of outside assistance towards the athletes is allowed only at Petrostrouga, Oropedio, katafigio A, and "Prionia". In case of rules violation, the athlete will be disqualified immediately. 12. LITTER: Dropping litter is strictly forbidden along the route and is penalized with disqualification. 13. MOVING ALONG THE TRAIL : The athletes are obliged to move along the trail without forming groups that extend in width, preventing others that would like to overtake. 14. CATERING : The organization is responsible for food and liquid catering of the athletes, supporting them in 11 intermediate Refreshment Stations en route. Athletes are allowed to carry their own supplementary provisions. No plastic cup will be provided on the Organizers part. 16. CHECKPOINTS : The checkpoints of the race are 11. All Refreshment Stations are Checkpoints also. Any athlete, who fails to pass at least one of the checkpoints, is automatically disqualified. 17. OBJECTIONS : Objections, no matter the reason, are handed in by the athlete alone, no later than 30 minutes after he/she has finished the race. The decision of the committee for objections is issued no later than the time of the award ceremony and cannot be disputed. 18. SECURITY : The Committee is responsible for the surveillance of the route of the race using staff specialized in security, rescuing and medical issues for the athletes in need. 19. 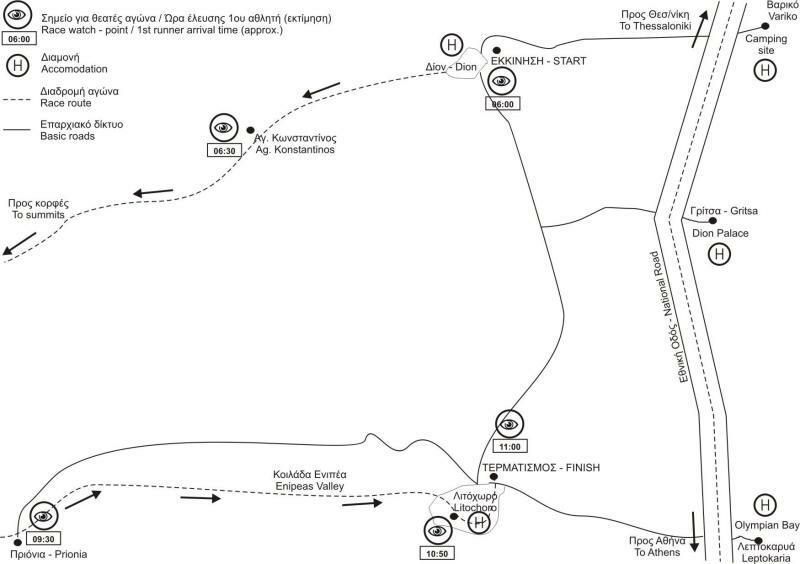 MODIFICATION OF THE ROUTE : In case of emergency (especially dangerous weather conditions) the organizers maintain the right to modify the route, so that no athlete will be exposed at risk. 20. AWARDS: A remembrance medal is awarded only to the athletes that crossed the finish line within the set time limit. 21. DISCLAIMER : The Committee is not responsible for death, injury or damage of the athletes health, who by submitting their participation form, declare that are aware of the dangers existing in the mountainous environment and assure that their health condition is such that allows them to compete. No athlete is obliged to present a medical certificate. 22. MODIFICATION OF RULES : The organizers maintain the right to modify the regulations of the race without further notice.